For chewing, give sterilized bones, large-ish ones that don't have any small parts or flakes that can come off and be choked on. Don't give puppies or adult dogs a chew toy unless they will be under supervision. When leaving home, take away all the chewables and just let them have sturdy (unshreddable) stuffed squeaky toyor a hard rubber toy such as the Kong toys. Booda bones are all right under supervision, but take them away when they start to get small enough to be swallowed whole or choked on. Yorkie puppies are weaned on a high quality puppy kibble. They can stay on that for their first year, then move to a top quality adult kibble such as Science Diet Small Bite, which is a nice small manageable size kibble with good nutritional composition. Yorkie's teeth stay much healthier on a high-quality kibble diet. Canned foods and other soft foods, especially table scraps, contribute to the rapid decline of their teeth and require more frequent trips to the vet for cleaning. Yorkies should never be given people food except for cottage cheese and small chunks of soft frui, tomatoes or cooked vegetables (no butter). No pig ears, rawhide, greenies or any sort of treat that can be softened up with enough chewing to be subsequently choked on... very dangerous! For treats, give the smallest IAMS puppy biscuits and tiny bites of one of the softer treats such as beef jerky, puperoni, etc. but not too much because they are fattening. But in order for it to be a treat it does have to have fat content, or they will probably turn their noses up at it. It's okay (like everything) in moderation, and let's face it, you do need a treat for the very important training phase. On a budget? 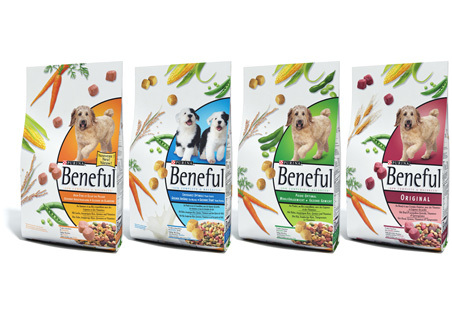 Although a steady diet of Beneful is not recommended, it makes a healthy and inexpensive treat for training and special occasions. Just buy the regular food, but dispense it one or two bites at a time, just a few times a day. Yorkies love it!